Weird and graceless. Shorten’s description of Abbott’s G20 address to world leaders was spot on. 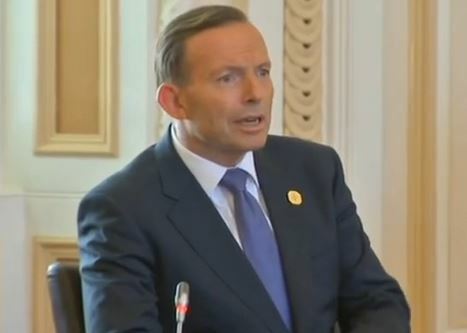 We all know that Abbott doesn’t perform well at public speaking. And we never expected him to say anything inspiring, intelligent or even informative at the G20. It’s not like he was going to admit he’d been wrong about climate policy and could Obama and Xi Jinping please help him to fix his faults. No, what we expected was for him to be uninspiring, unintelligent, and to say not much at all. Like he usually does. Because let’s face it, we’re used to three word slogans repeated slowly, spread out amongst ahh, err, arh, urms ad nauseam. But that’s not what we got from Abbott yesterday. Surprisingly, we got worse than this. Which is why it’s worth taking a closer look at what he actually did say. Correct me if I’m wrong, but I thought Pyne’s argument was that deregulation of university fees would make fees less expensive? Pyne has also argued that his policy is a ‘good deal’ for students, although this was clearly never the case. How is it a good deal to be paying more for something and having to pay interest you previously didn’t pay, whilst getting the exact same product you used to get? But the point is, Abbott’s government always argued that this policy was about improving the university sector – not about balancing the budget. Yet yesterday, Abbott was using this policy failure (let’s call a spade a spade that has failed to get through the Senate) as one of the reasons he’s finding those revolting peasants in his kingdom so terribly hard to force into line. Because students ‘never like to pay more’. Apparently Abbott’s budget woes are nothing to do with his and Hockey’s incompetence and are instead apparently all university students’ fault and their sense of entitlement that they should be able to get an education without taking out a mortgage on their future. An education, by the way, that benefits the long term economic success of Abbott’s precious economy. Not that Abbott seems to be able to put two and two together in this way. Abbott hadn’t finished yet though, because it wasn’t just the students who were to blame. It was also the sick. Those pesky sick people and their sense of entitlement that they should be treated in a health system that they pay for through their taxes that was set up to look after all Australians from cradle to the grave. How dare these revolting peasants think they should be able to see a doctor for free when they are sick! But at the heart of this whole argument is that a ‘price-signal’ (you know, like the carbon tax was a price signal to reduce carbon pollution) will reduce visits to the doctor, and will therefore reduce the cost of this universal health sector, which is funded by Australians through our tax system. The only way this could ever possibly be the case is if Abbott believes that Australians aren’t really sick and are actually just whingey hypochondriacs who need to be put off from their whingey hypochondria through a price signal. Or, his government believes that poor people who can’t afford the $7 co-payment should put up with being sick and shouldn’t be treated for ailments that could become much worse if not treated, such as lumps that can become a range of life threatening cancers or a heart problem that could easily be treated before it becomes catastrophic heart failure. Perhaps Abbott would prefer the poor just died without costing his budget any money. See why I felt offended? I was also frustrated that Abbott forgot to mention that his great-big-GP-tax was not actually going to be used to fund a budget surplus. It was being used for a $20 billion research fund for use by the private research sector. At the same time as Abbott is cutting the apparently wasteful CSIRO. Funny the small facts Abbott chose to leave out of his grand whinge. ‘…it doesn’t matter what spending programme you look at, it doesn’t matter how wasteful that spending programme might appear, there are always some people in the community who vote, who love that programme very much’. Get that people? It’s all of us voters who are so stupidly in love with government spending on programs that are just a complete waste of government spending. It’s all our fault that Abbott can’t balance his books! Us stupid voters refuse to let him send a wrecking ball through our civilised society that we have spent generations building! How dare we block his wrecking ball! So yes, I was offended, as a member of the domestic audience that was the true target market for this speech. But once I had calmed down and thought about it for a moment, I realised that I was also incredibly proud of Australians. Abbott can blame us all he likes. But the fact of the matter is that the worst of Abbott’s budget – the parts that hit the most vulnerable hardest – like the GP co-payment, like Pyne’s assault on the higher education sector – are being blocked by our democratically elected leaders in the Labor Party, the Greens, various independents and low and behold, the Palmer United Party. So we might be dumb enough to elect Abbott in the first place, but I hope the world leaders, and those across the world who may have been tuning in, can see we’re not dumb enough to let him wreck the place, no matter how hard he might be trying. Well bill shorten did get that right weird and graceless! In fact that was kind! Whoever is his speech writer should be sacked forthwith. Im embarassed for australia . A very disappointing performance. I can’t wait to see what the angry old white conservatives are spewing in the News Corp blogs on Monday. It will be a hate fest of epic proportions. I will keep my chunder bucket handy for their tributes to the great leader but I also expect to be laughing my head off at the same time. Yes, I was offended. I was also embarrassed and disgusted. That a Rhodes Scholar, traditionally one of the most intelligent of our nations student body could sink to this level has left me angry. Thanks for your thoughts and passions about the truth Victoria. Always look forward to reading your noteworthy political facts. What do we expect from Toxic Abbott is just that. Wired is not the word just plain stupid if anything. Abbott is well know for insisting on writing his keynote speeches himself. And this speech bears all of those personal hallmarks. Surely no-one could have vetted this? And if they did, imagine the original! I’m sorry Victoria but you simply don’t possess the eloquence to describe how fundamentally awful this speech was. No-one could. How it will be spoken of in whispered tones, decades into the future, when the debate turns to the worst speech ever delivered by an Australian PM in front of a distinguished foreign audience. We are blessed to have witnessed this moment in our life times. What did the Chinese leader really make of Tony’s struggles to get the Medicare co-payment through the parliament? What did the Saudi king make of Tony’s success in stopping the boats? What crossed Obama’s mind when Tony boasted of repealing the carbon tax. These are the great questions that will echo down the ages. Unanswered. At least Rupert liked it. It said it all ……. an absolute disgrace ….. totally centred on his own ego. The other leaders would have been puzzled as to what he was banging on about. He has no idea ….. of the puzzles that need solving ….. once it gets past the 3 word slogans he is wallowing . To think that it was the best he could do for a Global audience …… it made us look like clowns from down under . Imagine what it could have been like with a good orator of the standard of Keating . My heart bleeds for our Country …… it reminds me of the fools who were running it back in the late 60’s …… we have not progressed …. or should I say the LNP have not progressed. Good on you Gus back in the 1960’s and Menzies brings back conscription for the war in Vietnam and no I was not a anti Vietnam demonstrator as I joined the green machine and didn’t go overseas into combat. Well someone had to stay home and look after the pubs. Referring to my earlier comment, well I was right. The Oz blogs are on fire today with angry & frustrated old white Australian conservatives defending their saviour. It is like a religious fevour with them, they must fight to preserve their dwindling hold on their power base at all costs. The level of pure hatred expressed there is frightening.